A number of mothers and children were savoring homemade fruit salad one late afternoon at Wisma Transito (transit house) in Mataram, Lombok. A group of men sat on the porch of the building, playing games with their children. All of them actually have homes, friends and families and once worked as farmers, but four years after being evacuated from their village in Ketapang, West Lombok, West Nusa Tenggara (NTB), their old lives seem millions of years away. 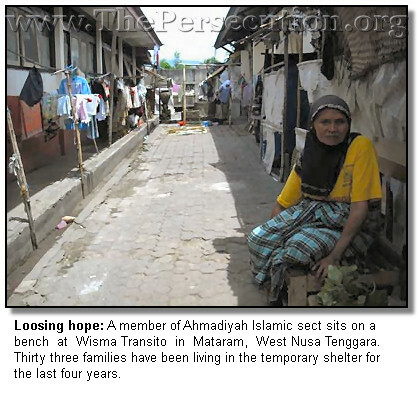 For the members of Ahmadiyah, returning to their village remains an impossible dream. Ahmadiyah community members were evacuated to the transit house — a government-owned building that used to serve as a refuge for migrant workers — on Feb. 4, 2006, and have been living there ever since. “We were told it was a temporary situation until security was restored in our village. 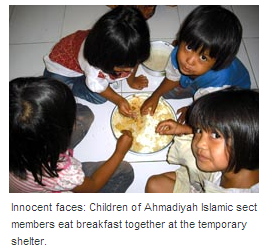 But it turns out we can’t return home even now,” said Syahidin (45), the coordinator of the Ahmadiyah refugees at Wisma Transito. During their four-year-long evacuation, 12 babies were born, with part of the evacuated congregation choosing to move to other regions outside NTB, leaving only 33 families or 126 people in the transit home. Some of the babies born in the refuge were even named after the place, like Transiti Mariam Sudikah (3), Transita Nuriyah (2), and Muhamad Iqbal Transito (2). The 3-by-3 meter makeshift rooms in the refuge are partitioned with curtains made of cloth, pre-used banners and sarongs. Highlighting the limitations and plain existence of the evacuees’ lives. There are only six bathrooms with barely enough water to satisfy the needs of all families residing there. For cooking, the sect members have built a basic kitchen from used-cement sacks and wood or bamboo to support the back of the building. Since mid 2008, the NTB social affairs office has stop delivering rice and other food aid to the refugees because social assistance was only made available for two years. They are still struggling to make a living. In the last six months, they had no electricity after they couldn’t afford to pay the bill. Worse, as citizens, they have lost their identities as they do not possess valid identity cards (KTP). “The cards obtained from Ketapang have expired and our applications for new KTPs has been rejected here. This makes it difficult to obtain certificates for free medical aid for disadvantaged people,” said Sarim Ahmad (40), one of the refugees. 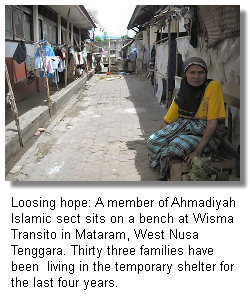 Without KTPs, the refugees have no access to free medical services and student aid (BSM). They had to pay the normal rate for hospital fees for each baby born during that time, and have not yet received allowances for their children’s education. The BSM scheme normally provides Rp 15,000 per primary school student, Rp 50,000 per secondary school student and Rp 75,000 per high school student a month. To support their families, some of the members of the sect have taken jobs in the construction industry, others in retail like snack shops. Sarim and 12 other members have been working for several months in Singkong Keju Mataram (Sikemat), a fried-cassava shop with 12 branches in Mataram. They only earn Rp 12,000 a day, working from 8 a.m. to 5 p.m. local time. “Sometimes we don’t have enough money to buy rice. But fortunately there’s the job at the snack shop, otherwise there would be nobody to turn to,” said Nuraeni (28), another Ahmadiyah evacuee with two children. “I want to be a policeman,” said Ridho (3), the son of Zuhri and Nuraeni, when asked what he wished to become when he grew up. But who can guarantee Ridho’s dream will come true, when his parents cannot afford to pay for basic health and his education?